This past week we relaunched our Desert Horticultural Society of the Coachella Valley Field Trips and we could not have done better than the Sam and Alfreda Maloof Foundation Home and Discovery Garden. Over and over our group was surprised and delighted with our private tour and time in the garden made the day better-than-best. Superlative, I know, but for me it was super amazing. We were early so we wandered around outside the unpreposessing buildings, marveled at all the hanging Christmas Cacti and peeked in the window of Sam’s workshop where furniture is still being made. 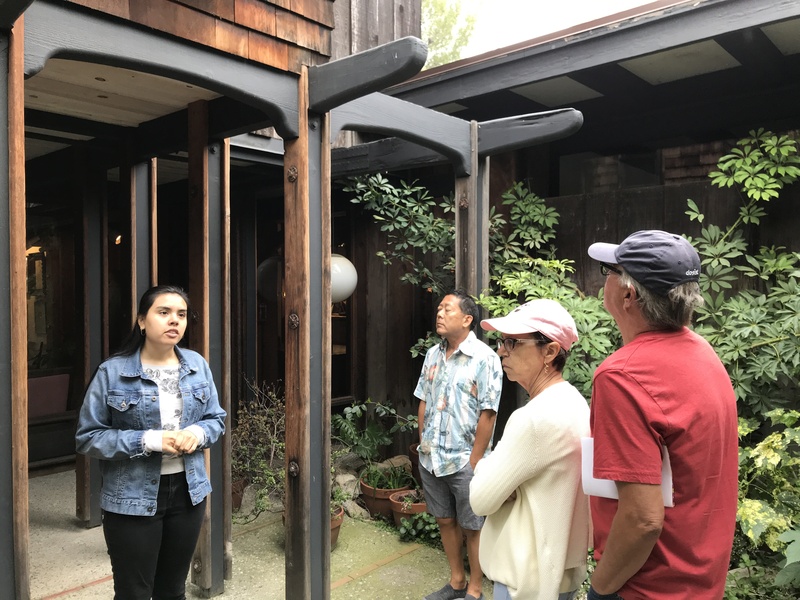 Our tour began behind a gate in an intimate courtyard that did not betray the magic that lay just inside the front door of the home. The home was so much more than we expected with Sam and Alfreda Maloof’s eclectic collection of ceramics, paintings, religious objects and crafts. Everywhere you looked the creative and ingenious details of this hand built home stood out. And each room was furnished with Sam Maloof’s own furniture built throughout his career. 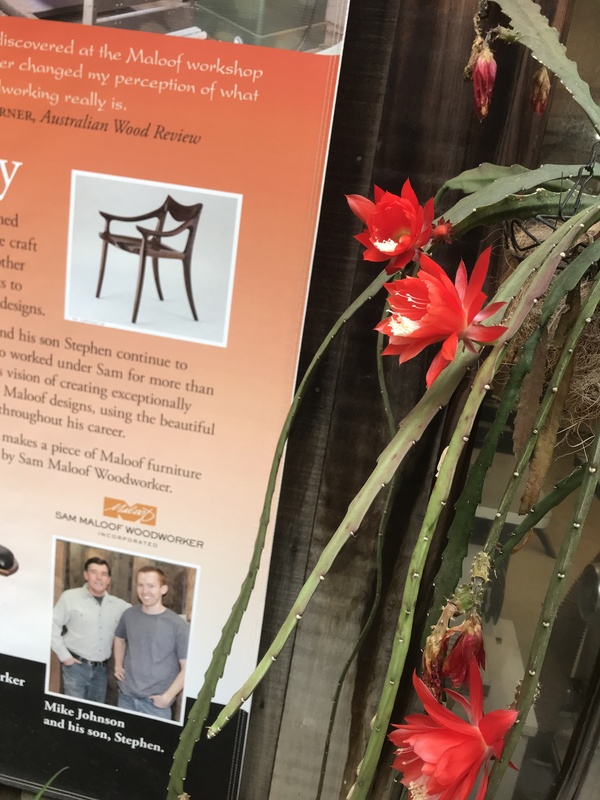 One thing you were allowed to do in the home was touch the furniture, what a treat to feel the love and care that went into each piece and feel how Sam’s designs evolved over his career. Rockers and chairs had obvious visual changes in design to become more sculptural as time went by, but they also had more subtle changes to make them more comfortable for the human body. At the end of the tour we were able to sit in one his latest designed chairs and it seemed molded to all of our bodies, it was so comfortable. Without photography, it’s not permitted, you will have to imagine the distinctive knobby door handles and pulls, the subtlety curved mortise and tenon joined window moldings and doorways, the clink the loose brick floors make walking on them, the soaring post and beam ceiling of the tower room and the higgily piggily path from room to room in this home built one room at a time. Maloof began building furniture because he could’t afford to furnish his home and the home became a living laboratory for designs. His first dining table was walnut with cork inlay, a combination he moved on from very quickly to using mostly a single wood, his favorite walnut. Sam Maloof’s furniture is thoughtful with his use of live edges, burls, grain, curves and joinery. A later dining table has individual drawers for place settings at each seat, upholstery became more tufted and plush as years went by and his cradle is so well balanced it swings from a delicate breeze in the room. Outside weaving its way down the hill, the garden is highlighted this Spring by buckwheats, lavenders, verbenas, sages, citrus and the dramatic Matilija Poppy (sometimes called the Fried Egg Flower), along with agaves and other succulents. 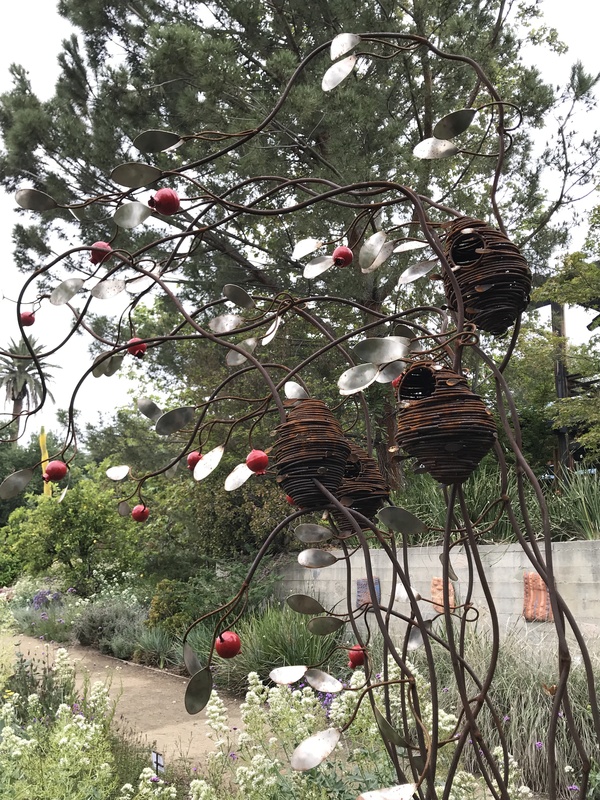 Sculpture is a feature of the garden and leave plenty of time to take it all in at your leisure with pieces from Californian artists Steve Reiman, Stan Bitters and many others. I’ll be back to spend more time strolling along the paths, absorbing the art and looking at how it’s integrated into the garden throughout the seasons. We welcome new members and look for more exciting field trips and programs to come this Summer and in the Fall.